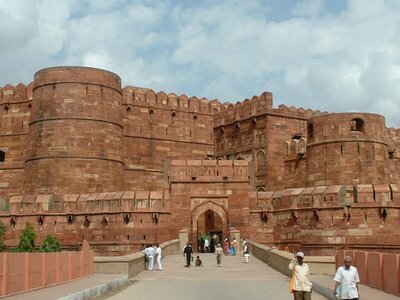 Today we went to Agra Fort, which is the sister monument to the Taj Mahal. We saw the Grape Garden, or the Anguri Bagh. It took us about 3 hours, with all the amazing sites. We also visited the Pearl Mosque, The Gem Mosque and the Ladies Bazaar. We stopped in a little restaurant on our way back. We had some flatbread, butter chicken, some chutney made with coconut, and for dessert we had ice cream, which was very good. It was creamy and tasted like cinnamon. We took a cycle rickshaw back to the Garden Villa Home stay. It was pretty cramped, but it was lots of fun. We asked the lady at the hotel for a local market and decided to go there. It was a bit father then expected, so we took a taxi. The Kinari Bazaar was huge there was so much to look at, the colors and the different trinkets. While there we all got brightly coloured scarves. I got a box with wonderful inlay work done on it. It almost looks handmade, we had to bargain and almost walked away. Sarah got some great little earrings, I’m not sure if they are real, but they look great. And Cassie got a very beautiful gold necklace. While we were there we also got petha, which is a specialty candy in Agra. We got back to the home stay after a bottle of warm beer, which was not inviting at all, and supper, we were completely wiped out, but ready for another day! 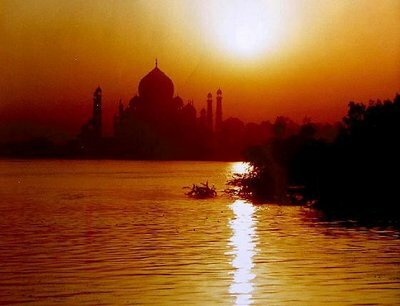 I have always wanted to visit India! You are a very lucky bunch to have experienced all these neat places in the area. Out of all of the different Mosques and temples, which was your favorite one and why would you recommend it to a tourist?